The Great Barrier Reef lies off the coast of Queensland: 2000 kilometres of spectacular coral reefs, sand cays and islands, Australia’s most precious marine possession. Teeming with life, it covers 350,000 square kilometres. In the late 1960s the Reef was threatened with limestone mining and oil drilling. A small group of dedicated conservationists in Queensland – John Büsst, Judith Wright, Len Webb and others – battled to save the Ellison Reef from coral-limestone mining and the Swain Reefs from oil exploration. 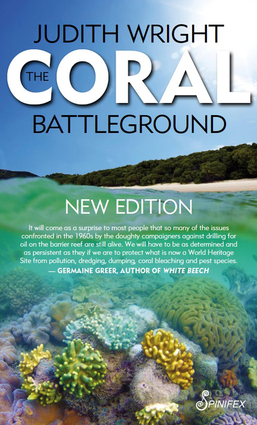 The group later swelled to encompass scientists, trade unionists and politicians throughout Australia, and led in 1976 to the establishment of a guardian body: the Great Barrier Reef Marine Park Authority.That it still survives is a legacy of activists, artists, poets, ecologists and students. In 1967 they were branded as ‘cranks’; now they should be recognised as ‘visionaries’. Judith Wright is considered to be one of Australia's greatest poets; she was also an ardent conservationist and activist. Over a long and distinguished literary career, she published poetry, children's books, literary essays, biographies, histories and other works of non-fiction.Her commitment to the Great Barrier Reef began in 1962, when she helped found the Wildlife Preservation Society of Queensland. She went on to become a member of the Committee of Enquiry into the National Estate and life member of the Australian Conservation Foundation.Judith Wright worked tirelessly to promote land rights for Aboriginal people and to alert non-Aboriginal Australians about the awful legacy Europeans have left upon Aborigines and the land. She has written 'The Cry for the Dead' (1981), 'We Call for a Treaty' (1985) and 'Born of the Conquerors' (1991). She died in 2001.Judith Wright was awarded many honours for her writing, including the Grace Leven Award (twice), the New South Wales Premier's Prize, the Encyclopedia Britannica Prize for Literature, and the ASAN World Prize for Poetry. She received honorary degrees (D.Litt.) from the Universities of New England, Sydney Monash, Melbourne, Griffith and New South Wales and the Australian National University. In 1994 she received the Human Rights Commission Award for 'Collected Poems'.